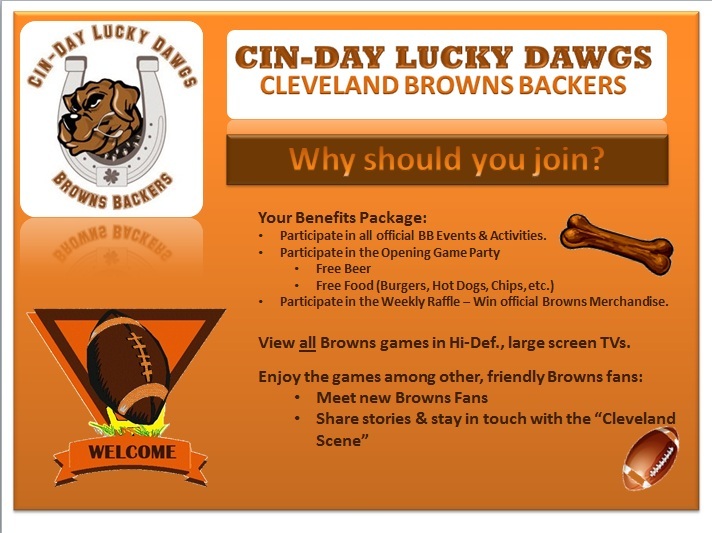 JOIN The Cin-Day Lucky Dawgs Browns Backers Chapter. In addition to being listed on a local roster with a Browns Backers club, The Cleveland Browns Office asks that all Browns Backers register their individual profiles on the Cleveland Browns’ website. This only takes about 5 minutes of your time. Just follow the step-by-step instructions below on how to register your profile on the Browns’ website. We certainly appreciate it! o NOTE: You will not be able to join our club until your profile is fully completed. Once your profile is completed in its entirety, click on the ‘Backer Tracker’ at the top of the page. Once the Club Profile has appeared, click on the orange circle, “Sign Up for this Chapter”. · That’s it! You are in. · The club President will be notified that there is a request to join their club. Once they have accepted you, you will receive an email notifying you that you are an active member of the club. DUES: The dues help fund all club functions including our parties, raffle, player appearances, etc. 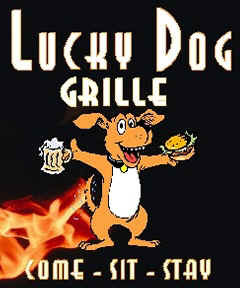 To pay your dues, please make your check or money order out to Cin-Day Lucky Dawgs and mail your dues to our treasurer, Georg Lastoskie at 7420 Capri Way, Apt 7, Maineville, OH 45039. Our dues are $20 per adult (over 18) and kids under 18 are free. Please print your email address on your check or on a separate sheet for our records. Thank you. 1) Do Not Move Tables. Table placement is governed by Fire Code. Please leave tables where they are. If necessary, please ask the management or staff for assistance. 2) Do Not Stand in the Aisles. Please take a seat, otherwise you are blocking peopleï¿½s view, staff movements and creating a safety hazard. 3) Do Not Become Verbally or Physically Abusive to fans of any team, other patrons or the staff. 4) Watch How Much You Drink. Do not become intoxicated and please DO NOT DRINK AND DRIVE! 1) Be kind to and remember the wait staff; your tips help pay their bills! We bring in business, but we also take up a lot of room for a lot of time. 2) Large parties should come early! If you want a big table, send someone early and consider the large tables in the game room area. Remember, do not move tables together or ask for assistance from the management. 3) Be a good sport! In the end remember, it is only a game and other fans love their team, too.